Abstract: The Data Science group at The New York Times develops and deploys machine learning solutions to newsroom and business problems. Re-framing real-world questions as machine learning tasks requires not only adapting and extending models and algorithms to new or special cases but also sufficient breadth to know the right method for the right challenge. I’ll first outline how unsupervised, supervised, and reinforcement learning methods are increasingly used in human applications for description, prediction, and prescription, respectively. I’ll then focus on the ‘prescriptive’ cases, showing how methods from the reinforcement learning and causal inference literatures can be of direct impact in engineering, business, and decision-making more generally. Bio: At Columbia, Chris is a founding member of the executive committee of the Data Science Institute, the Department of Systems Biology, and is affiliated faculty in Statistics. He is a co-founder and co-organizer of hackNY (http://hackNY.org), a nonprofit which since 2010 has organized once a semester student hackathons and the hackNY Fellows Program, a structured summer internship at NYC startups. 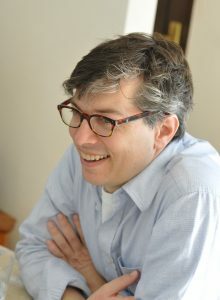 Prior to joining the faculty at Columbia he was a Courant Instructor at NYU (1998-2001) and earned his PhD at Princeton University (1993-1998) in theoretical physics. He is a Fellow of the American Physical Society and is a recipient of Columbia’s Avanessians Diversity Award.